Joe Bianchi was an Italian immigrant who immigrated to America where his family settled in Victoria, Texas at the end of 1885. Joe’s brother Paul began working as a blacksmith and eventually brought Joe along and taught him to work metal as well. In 1901 Paul and Joe opened Bianchi Brothers Blacksmith shop in Victoria and they worked together until 1909 when Joe opened his own shop to focus on bit and spur making. Joe Bianchi grew his bit and spur business and eventually was one of only a handful of makers who were able to produced enough bits and spurs to publish a catalog of his wares. 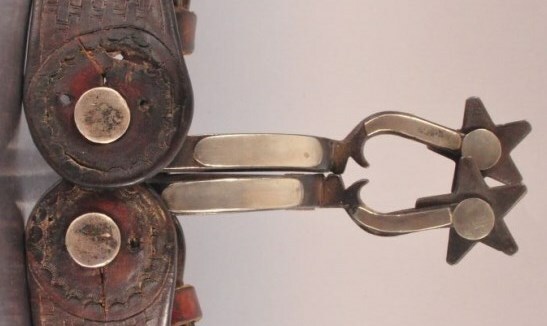 Bianchi was and is most famous for his Bottle-Opener style spurs and while there is some argument about whether he invented the design he is certainly the name most associated with the bottle-opener shank as he perfected the design and produced large quantities of them. While the Bottle-Opener shank is most closely associated with Bianchi its popularity was cause for many other famous makers to copy the design, so just because something has a Bottle-Opener design does not mean it is a Bianchi. For help with identifying, authenticating, or valuing your Bianchi bits or spurs, please Contact Us! Click here for information on Bianchi Maker’s Marks. Note: There is a contemporary spur maker named Glen Bianchi, so just because someone says it’s a Bianchi it’s not necessarily Joe.